The first Makerland is over – if you read only the first sentence of this blog, the conference was great, watch out for the second edition (hopefully there will be one)! What is Makerland? A hardware conference for non-specialists (not only developers, though they were the majority) – think Arduinos, Raspberry Pis, sensors, Mindstorms, 3D printers, embedded devices, Internet of Things. On the software side, (almost) everything seems to be done in Node.js ;-). Why is Makerland special? First of all, it is something completely different to what I’m doing daily (which is coding in Scala and being one of 25 CEOs in SoftwareMill). I did some “make things” stuff before (see e.g. piano pedal and ibeacons), so I wasn’t completely green in the field, still I learned a lot. The format of the conference was quite unusual: the first half of the day was full of talks (as for my hobby-level too many focused on actually manufacturing and shipping your thing on a larger scale), and the second half was filled with workshops, which you can choose and switch freely (free seats permitting). Completing one workshop took from 1 hour to a whole afternoon, so I had to make some hard choices, as time and energy was limited. I enjoyed all the workshops I attended: building a sumo bot, soldering, creating a makey-makey-style sphero controller with Cylon.js, sewing a smart watch, flying with a quadcopter and more. I also 3d printed a turtle and a magic wand, which is a hit with my daughter. Speaking of turtles, the last day was a hackaton, where you could build whatever you wanted. Do you remember the Logo programming lanugage? You controlled a turtle (with code) which did various drawings. 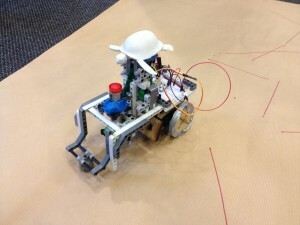 In a team with Jacek, Antoni and Jakub, we decided to build a real-life version of the turtle: Turtlebot. We’ve used the sumo bot parts as the base, Lego for pen support, Play-Doh for actually holding the pen, some servo motors, spark as a wireless controller (all conference attendees got a Spark Core!) and some arduino/python/js code. Thanks to the Spark cloud, we were able to control our turtle via REST calls, and hook up a Python DSL to accept Logo-like commands. The WiFi was a bit of a problem, and the robot lacked some precision, but as for a first prototype, I think it behaved very well. 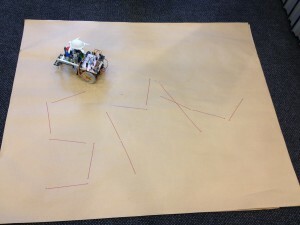 And guess what – we won the hackaton :) The 3d turtle model now waits for the 2.0 version of the robot. Thanks again to all of the organizers for their effort, and see you in a year!